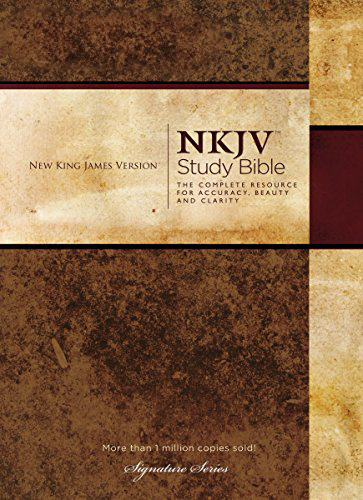 The NKJV Study Bible, Second Edition, the most comprehensive study Bible available, is now better than ever! The acclaimed The NKJV Study Bible is the most complete study system for pastors, teachers or Bible students who desire accurate study in God's Word. It is now better than ever, including more features to make it the best all-purpose study Bible available. Using the trusted New King James Version, The NKJV Study Bible, Second Edition has the mind of a scholar and the heart of a pastor." Nelson's skilled team of scholars has produced THE study system to reach for when accurate, beneficial study in God's Word is the goal. Over 15,000 versified study notes give new insights into the text and enhance understanding through concise and clear explanations. Along with Strong’s keyed word studies, and over 100 long-format articles, the study material in this Second Edition is second to none. This edition includes the NKJV, the NKJV Study Notes, and a Strong's Dictionary.